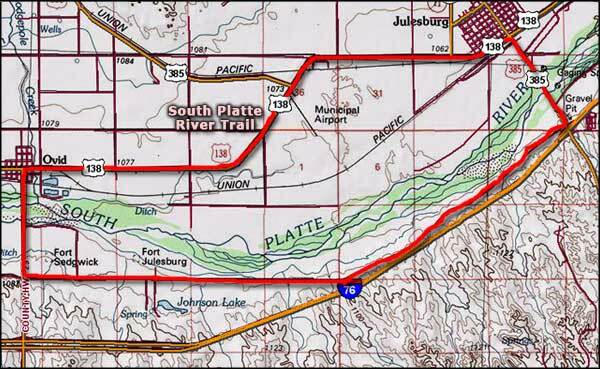 In the 19th century, what is now the South Platte River Trail Scenic Byway was one of the main routes westward and was used by tens of thousands of pioneers. This 19 mile loop features interpretive signage at the original Julesburg townsite (Colorado''s only Pony Express station) and Fort Sedgwick (established in 1864 to protect the trail and the telegraph line). Other markers commemorate the other 3 Julesburg townsites, the Transcontinental Railroad (the original one from 1869) and the Lincoln Highway (the first coast-to-coast automobile road in America). Julesburg is also the site of one of Colorado's primary Welcome Centers.